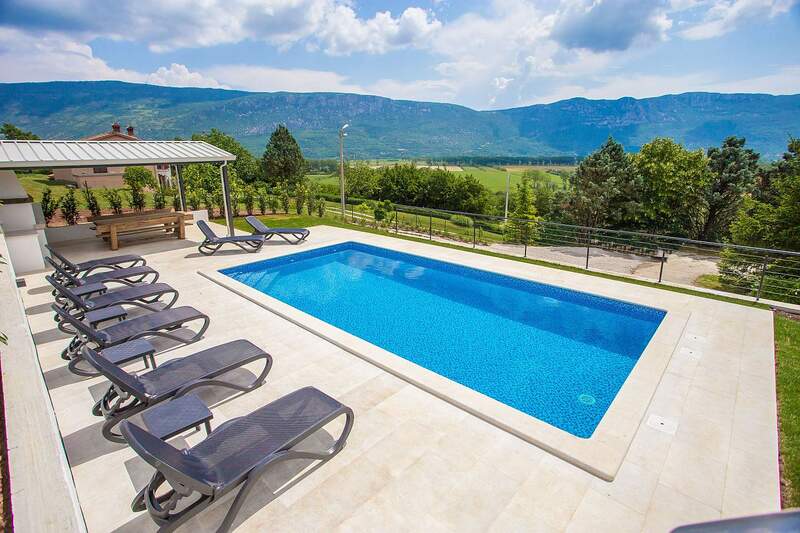 Villa Maggiore is a modern holiday house with swimming pool located on the edge of the village Cepic Purgarija at the end of the slopes of mount Ucka (Ital. Maggiore), after which the house is named. The house is located in a quiet place, distant only 10 km from the sea in Plomin harbor, 16 km from Labin and 21 km from Rabac, tourist resort with beautiful pebble beaches and numerous sports and entertainment facilities. 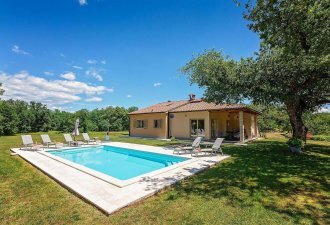 Guests of the villa have on their disposal private garden, 32 sqm large swimming pool, covered terrace with table and chairs for relaxing, barbecue, children's playground, trampoline and 4 parking spaces. The house has a total living area of 230 sqm spreaded on two nicely and modernly furnished floors. At the ground floor there is a living room with sitting area, well equipped kitchen, dining table, double bedroom, bathroom/toilet and cosy furnished tavern with a fireplace. On the first floor there are three air-conditioned double bedrooms, each with its private bathroom/toilet and SAT-TV.